This awesome but hidden mural was commissioned by a partnership between the Psychiatric hospital of Lisbon and GAU (Urban Art Gallery). Many artists were invited to contribute with their artistic interpretation for the “Mental Illness Day”. The “Blue Wall”, as it’s known among locals, it’s a tribute to those who’ve lived most of their lives on the other side of the wall. These extraordinary works are on display on the walls surrounding the psychiatric hospital of Lisbon, that’s located a few blocks from Alvalade district. 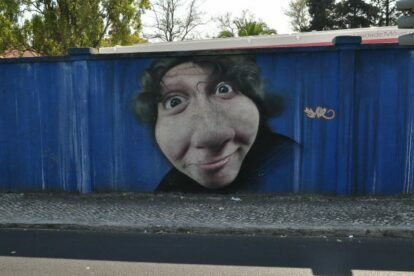 This is a great example of Portuguese street art, a showcase of many artists where you’ll see excellent realistic drawings, amazing surrealistic creations and portraits. There are many faces looking in despair, some abandoned souls with penetrating eyes, others melting in stained glass colors. There are some that look a bit disturbing and almost creepy, but that was the purpose, as they reflect dementia and other kinds of psychiatric disease. They look so real they will make you look twice – from all the faces you’ll see, for me the scariest is the one face without any expression: no eyes, mouth, nose… Its indistinct expression makes you confused and the obscure figure looked like it came straight out of a horror movie. There are outstanding works from Slap, Nomen, Tamara Alves, Odeith, Addfuel, Eime and Smile. Make sure you can see it all!